Amid the calls from liberals for an “honest discussion” and “coming together as a nation,” there is always something lurking, just off to the side. The issue at hand doesn’t matter, once conservatives take up the offer, from the wings comes the go-to weapon in the progressive’s arsenal: the human shield. They’re usually in the form of children or the elderly, ready to present an incomplete, carefully crafted version of their personal story designed to scare the hell out of people and pretend their extremely rare circumstance is the norm and could happen to you or someone you love. Talk of reforming entitlements before they economically crush future generations is met with tales of grandmas eating cat food and living in refrigerator boxes. The concept of people being allowed to keep more of the money they earn is greeted by outcries of how programs to give poor single mothers all the basic necessities of life might suffer. Never is there a discussion of how someone could put themselves in these positions, the choices and mistakes they made in their lives to end up dependent upon government taking from other people to keep them from having to make adjustments to the reality they’ve constructed for themselves. And never is there a discussion of alternatives to the government being people’s life rafts rather than friends, family, or local organizations or churches. No, to point out the deficiencies and financial burden of liberal government being the source of all good is met with cries of you being a monster as the accuser ducks quickly behind their human shields to deflect criticism. The children from Marjory Stoneman Douglas High School are the latest entrants to the “above criticism” club. No matter what they say, no matter how outrageous, slanderous charges they level against people who dare disagree with them, liberal journalists let it slide. Or they cheer. Adults who should know better let lies go because they share the goals of uninformed, indoctrinated kids who haven’t yet finished puberty. Worse, they quickly slide behind those ignorant kids when the deserved criticism flies their way. They build them up, then use them to protect themselves. In it, CNN declares one of the points as, “They engaged with the media,” as if there aren’t families in Chicago or Baltimore who’d love to talk with national media about their loss…the media just doesn’t care to hear their stories. Just like they aren’t interested in hearing the stories of MSD students who disagree with Boss Hogg and his merry band of anti-Second Amendment bullies. Buried in the glowing piece of fan fiction is, “They welcomed support.” It’s a glossing over of how nearly every liberal activist group glommed on to those students and did all the work, handled all the logistics. Essentially, these groups shoved the kids out front and tucked their agenda in behind them. This “organic movement” has been orchestrated by Democrats since the day after the shooting, when Congresswoman Debbie Wasserman-Schultz admitted she called and started pulling things together with the usual suspects in the students’ names. All this is ignored because to remind an audience of it would be to harm the narrative. 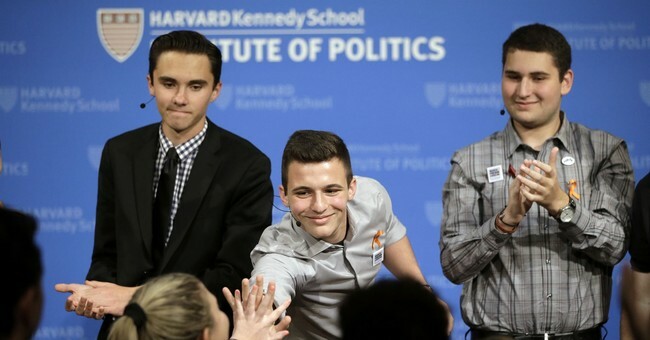 Instead, we’re given, “A brief history of how Parkland survivor David Hogg keeps schooling lawmakers on social media.” It didn’t focus on Boss Hogg’s lies or ignorance – CNN has never written anything shining a light on those, nor have they corrected his lies on air (something their media “reporter” proudly admitted) – instead it repeated his slanders of Senator Marco Rubio. Hogg couldn’t write a more ego-boosting private diary entry than the glowing media coverage he’s received if he tried. On CNN personality even declared, “What kind of dumbass college wouldn’t want you?” when discussing how colleges are rejecting the little social justice warrior. (Maybe college already overrun with wealthy, white, privileged, arrogant little brats? Surely Hogg wouldn’t deny a member of a “marginalized community” their space at UCLA simply because he wanted to go there, right?) When the media does find a newer, shinier object to hide behind, expect this foul-mouthed product of bad parenting and unfettered media love’s fall to make Lindsay Lohan’s tumble to look like a walk in the park. But it’s not just guns and entitlements where human shields are the go-to deflection for liberals, it’s pretty much anything. Their arguments, as much as they attempt to make them, are not based in logic, the law, or the Constitution; they are based on emotion. When the Trump administration announced they were adding a question on citizenship to the 2020 census, liberals erupted with a fury you’d expect if a Republican administration had forced the sale of guns to Mexican drug cartels and didn’t trace them. Of course, in recent decades the question has been included more often than not, but Holder doesn’t care. He, California, New York, and nearly every other Democratic state AG announced their intention to sue on behalf of the sweet, nourishing illegal aliens in this country. They trot out the children, the single mothers, the people who’ve been here for years, and say they’ll be scared to answer the census and, therefore, cities and states that harbor them will be shortchanged when it comes to federal money and Congressional representation. You know what that “worst case scenario” means? Actual Americans would be represented in our government, and our money would not go to provide benefits to people who have no business being here in the first place. The horror. Justice is not an exemption from the law, justice is not special treatment based on your national origin, and justice is not pandering to people based on their ethnicity to win votes. Yet, that is what liberals mean when they use the word. They trot out the kid who is afraid their parents will be deported and the single mom just trying to make ends meet. They don’t ever mention the 19-year-old high school dropout with the gang neck tattoo or the people scared to death of him, or the black single mom who didn’t get the job that went to the illegal aliens willing to work for cash under the table. To question this, is declared racist from behind a row of “victims” we’re supposed to feel sorry for. Sorry, I don’t. I care about Americans, I care about the people who followed the law to come here. I don’t care about line-cutters who simply and knowingly ignore the law because they don’t think it should apply to them. I don’t care if they or anyone are so afraid of answering a question on the census that they don’t. And I don’t care if the jurisdictions that protect them suffer for it. They elected the politicians who encourage this behavior, the piper doesn’t play for free – he has to be paid eventually. You don’t get to hide behind children when the bill comes due. Liberals will always use human shields because it’s easier than having a “honest discussion” and helps win more votes than “coming together as a nation.” Plus, there will always be an endless stream of people willing to be used. The addiction to attention is the new national pastime, and if you’re willing to be used and eventually discarded like a tissue, there will never be a shortage of the need.